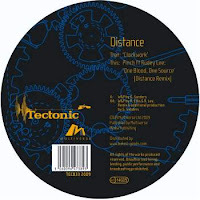 'Tectonic is very pleased to present a particularly heavyweight slate from one of the masters of bass, the legendary DJ Distance. As a foundational pioneer to dubstep with many system rattling classics under his belt - either on his own faultless imprint Chestplate, on his albums for Planet Mu, or even his early Hotflush releases - Distance always makes an impression by means of impeccable production skills, earthquake subs and a refined thirst for darkside power chords! Following on from his last outing on Tectonic in 2006 as part of Tectonic Plates Vol 1, with 'Temptation', Greg Sanders delivers the excellent 'Clockwork' and the now anthemic 'One Blood, One Source' (Distance Remix). 'A: 'Clockwork' : Leading in with a fairly minimal 16 bar intro, 'Clockwork' tears through at the drop - unleashing a barrage of heavily weighted brutal bass, carefully ordered but chaotic drum programing which is simultaneously disorientating and driving - it's as if you are being sucked into miniature time holes in between the crack of the regulated snare pattern. As the track builds it shines full of the characteristics that make Distance stand out as a producer - each layer is carefully put together and meticulously treated resulting in a rhythm that fits the Tectonic style - unique, heavy, rolling, infallible and reserved for after hours, when the lights are down low. Pedigree. 'Special request !! 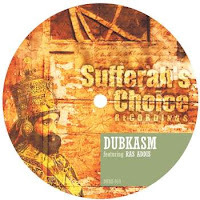 The people's choice has decreed that Ras Addis' City Walls become the next vinyl single from the acclaimed Dubkasm double album set 'Transform I' that blessed summer 2009 with its innovative incorporation of Brazilian sounds and deepest UK roots. So step up -this twelve is a generous package of City Walls cut nice and deep, horns sounding mellifluous and inflected with dread, and it is this impending mood the Shofar dub develops - allowing the militant rhythm to dominate centre stage - sound system ready and ultimately deadly. Backing it up is the equal devotional anthem Hail Jah with another exclusive dubplate special dug deep from the Dubkasm crew's killer selection - version like rain. Already huge favourites with the champion Iration Steppas sound system and big on plate with venerable systems such as Jah Shaka and Aba Shanti I - this is a big one for the steppers crew of all persuasions - please make sure to get on this early. 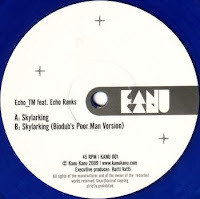 'Killer dubs - the debut single released by Kanu Kanu. The aim of this new vinyl imprint is to promote interesting and original artists from the Bass world - showing an emphasis apparent on all strands from reggae to dub-techno, minimal dubstep swung back right out to future garage. It's all run from Cairo, Egypt with overall conception and production by Polish producer Hatti Vatti - last sighted in 2009 on Indigo and Synkro's Manchester based Mindset Recordings, with his awesome 'Different Music'.